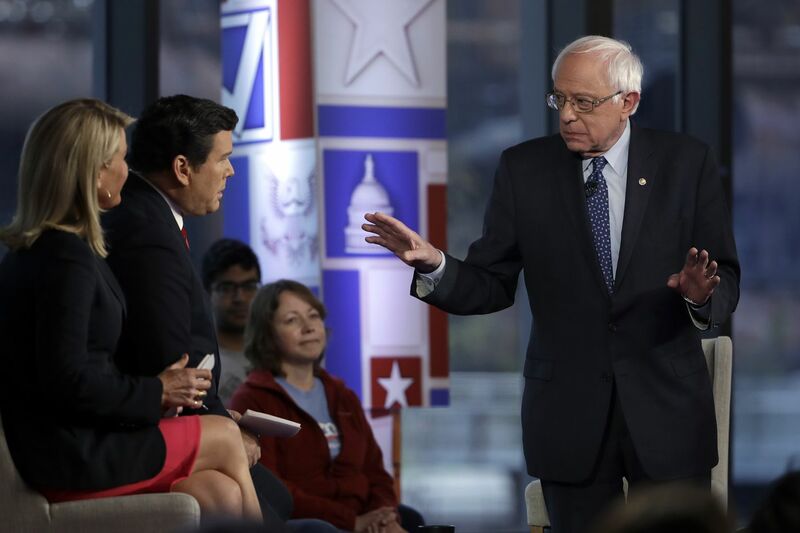 Sen. Bernie Sanders speaks during a Fox News town-hall style event Monday in Bethlehem, Pa.
What Sanders painted as a magnanimous gesture was really a calculated move to boost his presidential prospects: He needs Fox viewers to win the White House. According to the massive Cooperative Congressional Election Study, about 12 percent of Sanders primary voters cast their ballots for Donald Trump in the 2016 general election. These Sanders voters appear to have given Trump the margin of victory in the three states that handed Trump the White House. The Fox News town hall was held in Bethlehem, Pa., in a state where some 16 percent of Sanders supporters — about 117,100 people — voted for Trump; Trump won Pennsylvania by 44,292 votes. It was a similar story in Wisconsin, where about 9 percent of Sanders supporters — about 51,317 people — voted for Trump; Trump won Wisconsin by 22,748 votes. And in Michigan, about 8 percent of Sanders voters — or about 47,915 people — cast their general election ballots for Trump; Trump won Michigan by 10,704 votes. If Sanders wants to win the Democratic nomination, he needs these Trump voters to support him in the primaries. And if he does win the nomination, he needs them to stay in his column and vote for him instead of Trump in 2020. Can Sanders separate his former supporters from Trump? Going on Fox News and making his pitch that Trump has failed them is a smart way to do it. Indeed, Sanders not only participated in the Fox town hall, he published an op-ed on the Fox News website, in which he declared, "When Donald Trump ran for president he made a lot of promises to working families. He told them that he would protect their interests while standing up to the Establishment. Unfortunately, he did not tell the truth." During his town hall, Sanders criticized Trump for proposing an $845 billion cut to Medicare and made an impassioned pitch for his Medicare-for-all plan. Selling a government takeover of the U.S. health-care system on Fox may seem counterintuitive, but many of those who defected to Trump in 2016 are nontraditional Republican voters who were attracted to Trump precisely because he promised not to touch Social Security and Medicare. So, Medicare-for-all is not anathema to them the way it is to conservatives. Indeed, when Baier asked the town-hall audience whether, with a show of hands, they would be willing to transition from their employer-provided insurance to the government-run system Sanders is proposing, the pro-Bernie crowd cheered and many hands went up. It's a pivotal question. Sanders told her that Trump is not responsible for that progress — it began under President Barack Obama — and that most of the benefits of the global economic recovery and Trump's tax cuts have gone to the very wealthy, while Republicans refuse to give working families access to health care and a "livable wage." He is telling his former voters, in essence, Trump has failed you, and I can do better; Trump claims to be an outsider, but I am the real deal. Will it work? Will these former Sanders voters, having helped put Trump in the White House, stick with the president, or will they switch back to their first love, Bernie Sanders? The answer may well determine who wins the Democratic nomination — and the presidency in 2020.